This Summer, Bury Market and the Mill Gate Shopping Centre will play host to various activities throughout the holidays to make sure keeping the kids entertained throughout those six long weeks is just that little bit easier. Bury Market is collaborating with the Mill Gate Shopping Centre and Tower FM for a fitness and fun-packed calendar of events. 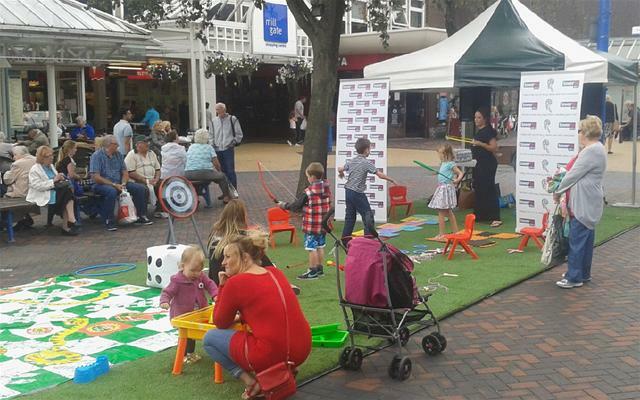 Every Friday in August from 11-2pm, the Tower FM team will be on the Market Square by the Mill Gate Shopping Centre hosting garden games and fun activities including; giant snakes and ladders, noughts and crosses, swingball and hopscotch. They will also be giving out free water and fruit to keep everyone hydrated and energised. Children's entertainer, Mr Yipadee will also make an appearance on the 8th, 15th and 22nd of August with exciting performances consisting of musical shows, interactive props and balloon animals. The team from East Lancashire Railway will also visit every Friday in August with their mascot Buffer the Station Cat to distribute 'kids go free' vouchers for the summer holidays. The Mill Gate Shopping Centre will also be giving one lucky person the chance to win a family ticket to Paulton's Park, the home of Peppa Pig World and £100's worth of accommodation vouchers. To enter, customers will simply need to fill in a form in centre, via millgatebury.co.uk or on their Facebook page.